If a user outside of your domain views or takes action on a document explicitly shared with them (as an individual or as part of a specific group), we will now show that event and that user’s details. Previously, this would be recorded as an anonymous user event. 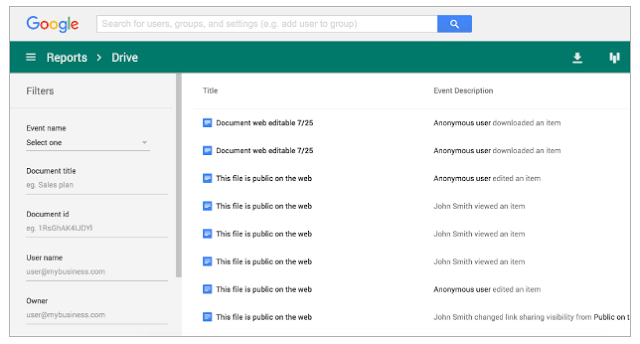 If a user outside of your domain takes action on a document shared with the public via link sharing, we will now show that event in the audit logs as an anonymous user edit event. Previously, only anonymous user views were recorded. In addition to the customer usage and user usage reports already in the Reports API, we will now show aggregated statistics around user behavior, like creating, editing, viewing, and trashing. These new metrics will only be accessible via the Reports API. Please note that the first two features above are only available to customers with Google Apps Unlimited and Google Apps for Education.